Shimla : To avoid choking Shimla’s roads it has been decided not to allow tourist vehicles to enter the hill station during the peak winter holiday season of Christmas and New Year’s eve. This ban on tourist vehicles will remain in force from Dec 24 to Dec 31. According to the new plan tourist all vehicles will not be allowed to go beyond the Tutikandi bypass crossing. Vehicles can be parked at Shimla’s recently built multi-storied parking at Tutikandi among other places. State roadways will ply buses from here every ten minutes to transport people to Shimla. 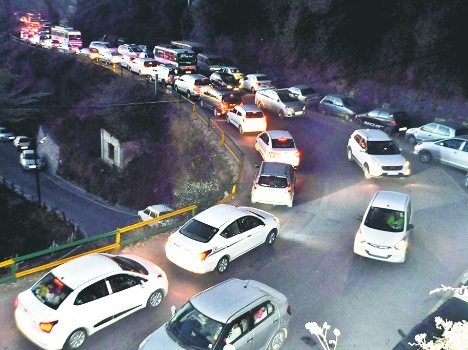 For many years Shimla witnesses a huge influx of Christmas and New Year holidaymakers which leads to the worst traffic jams causing inconvenience to both tourists and locals. In another significant move from now on whenever it snows tourist vehicles will not be allowed to go to Kufri. Vehicles will be stopped at Dhalli subzi mandi ground. Holidaymakers interested in seeing snow at Kufri and Wildflowerhall will be ferried in HRTC buses from Dhalli to Kufri and back. This will help avoid traffic jams and skidding. As compared to many tourists the HRTC drivers are far more experienced to drive on snow and ice covered roads. Within hours the state government did a U turn(possibly due to pressure from the powerful hoteliers lobby)saying now tourist vehicles will not be stopped at Shimla’s entry point.Only after parkings within Shimla are full tourist vehicles will be told to park at the Tutikandi parking.